Philip Alexius de László, MVO (Hungarian: Fülöp Elek László, 30 April 1869 – 22 November 1937) was an Anglo-Hungarian painter known particularly for his portraits of royal and aristocratic personages. In 1900, he married Lucy Guinness of Stillorgan, County Dublin, and became a British subject in 1914. László was born in humble circumstances in Budapest as Fülöp Laub, the eldest son of Adolf and Johanna Laub, a tailor and seamstress of Jewish origin. Fülöp and his younger brother Marczi changed their surname to László in 1891. He was apprenticed at an early age to a photographer while studying art, eventually earning a place at the National Academy of Art, where he studied under Bertalan Székely and Károly Lotz. He followed this with studies in Munich and Paris. László's portrait of Pope Leo XIII earned him a Grand Gold Medal at the Paris International Exhibition in 1900. 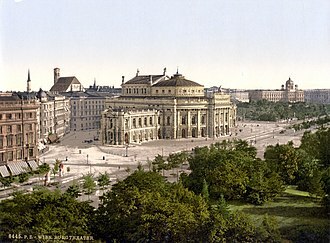 In 1903 László moved from Budapest to Vienna. In 1907 he moved to England and remained based in London for the remainder of his life, although endlessly travelling the world to fulfill commissions. 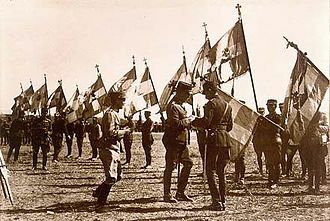 Despite his British citizenship, his marriage and five British sons, de László was interned for over twelve months in 1917 and 1918 during the First World War. He was exonerated and released in June 1919. Due to overwork de László suffered heart problems for the last years of his life. In October 1937 he had a heart attack and died a month later at his home, Hyme House, in Hampstead, London. ^ "The de Laszlo Archive Trust". delaszloarchivetrust.com. ^ "LASZLO DE LOMBOS, Philip Alexius de (1869 - 1937), Painter : Benezit Dictionary of Artists - oi". oxfordindex.oup.com. doi:10.1093/benz/9780199773787.article.b00104969. ^ "Laszlo, Philip Alexius de [formerly Fülöp Elek László; Philip Alexius Laszlo de Lombos] (1869–1937), painter : Oxford Dictionary of National Biography - oi". oxfordindex.oup.com. doi:10.1093/ref:odnb/34414. ^ "The Portraits of Philip de Laszlo". The Weekly Standard. 14 October 2010. 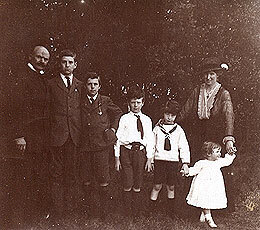 ^ "Photograph of László with his wife and sons". Archived from the original on 27 September 2007. ^ Hart-Davis, Duff (2010). Philip de László: His Life and Art. Yale University Press. p. 26. ISBN 9780300137163. ^ Hart-Davis (2010), p. 34. ^ Hart-Davis (2010), pp. 66–67. ^ Hart-Davis (2010), p. 71. ^ Hart-Davis (2010), p. 235. ^ "Parlour games". The Guardian. 20 December 2003. Retrieved 15 August 2007. 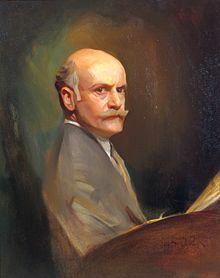 The article states that "László had not only painted the Austrian foreign secretary, Count Berchtold, regarded by many as responsible for the war; he had also been ennobled by Emperor Franz Josef in 1912. 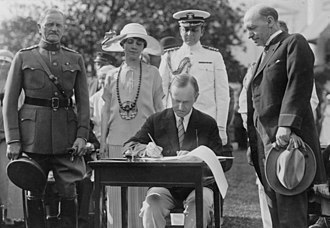 After warnings, he was arrested in the summer of 1917 and accused of making contact with the enemy by sending letters to his mother and brother. He was locked up in Brixton prison and Holloway internment camp as an enemy alien. He didn't sympathise with the enemy: the range of his sitters reveals his even-handedness. He was released due to ill-health, but was not vindicated until the summer of 1919. He had been unable to paint anyone outside his own family for two years." ^ "De László, His Life and Art". yalepress.yale.edu. Retrieved 17 October 2014. ^ "Philip Alexius de Laszlo's Comte and Comtesse Jean de Castellane". www.jssgallery.org. ^ "Photo of Elisabeth, Duchess of Clermont-Tonnerre". jssgallery.org. Retrieved 17 October 2014. 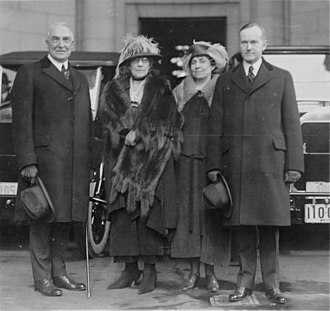 ^ "Photo of Calvin Coolidge". jssgallery.org. Retrieved 17 October 2014. ^ "Photo of the Duke and Duchess of Gramont". jssgallery.org. Retrieved 17 October 2014. ^ "Photo of Princess Andrew of Greece". jssgallery.org. Retrieved 17 October 2014. ^ The Studio, 105 (418), January 1928. ^ "Photo of Johnny de László (Philip de Laszlo's youngest son)". jssgallery.org. Retrieved 17 October 2014. ^ "Photo of Stephen and Paul de László (his sons, 1910)". jssgallery.org. Retrieved 17 October 2014. ^ "Photo of Pope Leo XIII". jssgallery.org. Retrieved 17 October 2014. ^ "Philip Alexius de Laszlo's James Robert Dundas McEwen". www.jssgallery.org. ^ "Philip Alexius de Laszlo's Mary Frances Dundas McEwen". www.jssgallery.org. ^ "Photo of Andrew W. Mellon". jssgallery.org. Retrieved 17 October 2014. ^ "Photo of Princess Charlotte of Monaco". jssgallery.org. Retrieved 17 October 2014. ^ "Photo of Prince Louis II of Monaco". jssgallery.org. Retrieved 17 October 2014. ^ "Photo of Edwina Mountbatten, Countess Mountbatten of Burma". jssgallery.org. Retrieved 17 October 2014. ^ "Photo of Louis Mountbatten, 1st Earl Mountbatten of Burma". jssgallery.org. Retrieved 17 October 2014. ^ "Photo of Joseph Ferguson Peacocke, Archbishop of Dublin (1908)". jssgallery.org. Retrieved 17 October 2014. ^ ""Vittorio Putti" by Philip de Laszlo (c. 1925) - Himetop". wikidot.com. ^ "Photo of Queen Marie of Romania (1936)". jssgallery.org. Retrieved 17 October 2014. ^ "Photo of Queen Mother Marie of Romania". jssgallery.org. Retrieved 17 October 2014. ^ "Photo of Theodore Roosevelt". jssgallery.org. Retrieved 17 October 2014. ^ "Photo of King Alfonso XIII of Spain". jssgallery.org. Retrieved 17 October 2014. ^ Webshots Wallpaper & Screensaver. "Webshots - Today's Photo". webshots.com. ^ "Photo of Queen Louise of Sweden". jssgallery.org. Retrieved 17 October 2014. ^ "Photo of Princess Alice, Countess of Athlone". jssgallery.org. Retrieved 17 October 2014. ^ "Photo of Duchess of York, 1931)". jssgallery.org. Retrieved 17 October 2014. ^ "Photo of Queen Elizabeth, The Queen Mother". jssgallery.org. Retrieved 17 October 2014. ^ "Photo of George VI of the United Kingdom, when Duke of York; 1931)". jssgallery.org. Retrieved 17 October 2014. ^ "Photo of Prince George, Duke of Kent (1934)". jssgallery.org. Retrieved 17 October 2014. ^ "Philip Alexius de Laszlo's Princess Marina Sketch". jssgallery.org. Retrieved 17 October 2014. ^ "Philip Alexius de Laszlo's Duke and Duchess of Ken [sic] 1934". jssgallery.org. Retrieved 17 October 2014. ^ "Photo of Ignaz Wechselmann (1894)". jssgallery.org. Retrieved 17 October 2014. Wikimedia Commons has media related to Philip Alexius de László. National Portrait Gallery biographical profile and links to images; retrieved 15 August 2007. Articles on de László, jssgallery.org; accessed 15 August 2007. Interview with the Hon. Sandra de Laszlo regarding her grandfather-in-law's work and current appeal; retrieved 15 August 2007. Royal Society of Portrait Painters' millennium catalogue; accessed 17 October 2014. 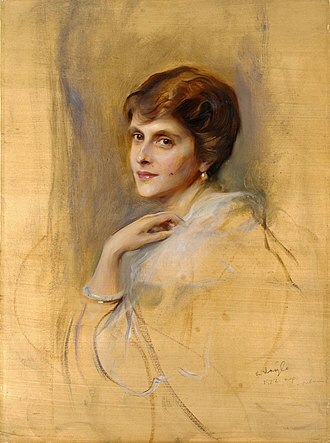 Portrait of Princess Victoria Alexandra Olga Mary of Wales (Oil on Cardboard, 1907), npg.org.uk; accessed 17 October 2014. Albert Apponyi de Nagyappony was a Hungarian nobleman and politician. He was born on 29 May 1846, in Vienna, where his father and he belonged to from an ancient noble family dating back to the 13th century. Count Albert Apponyi became a member of the Hungarian Parliament in 1872 and remained a member of it, with one short exception, from the late 1880s, he was the leader of the “united opposition, ” which consisted of all parties hostile to the Austro-Hungarian Compromise of 1867. He married Clotilde Apponyi in 1897 and he was Speaker of the House of Representatives of Hungary from 31 October 1901 to 6 November 1903. As the minister of education he drafted the laws, sometimes called Apponyi laws, reading and counting in primary schools was done exclusively in Hungarian for the first four years of education. Approximately 600 Romanian villages were left without education as a result of the law, by 1917,2,975 Romanian primary schools were closed. 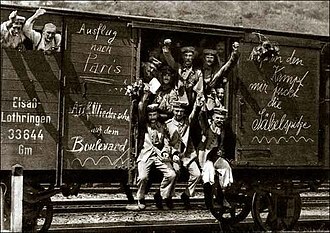 In the event, Apponyi’s mission to Versailles was in vain as the Allies refused to negotiate the terms of the peace treaty. Between 1911 and 1932, he was five times nominated for the Nobel Peace Prize by Hungarian universities and political groups, Count Apponyi was a noted orator and had wide ranging interests outside politics, encompassing linguistics, literature and music. Apponyi described his impressions of America in his autobiography The Memoirs of Count Apponyi and he was the author of the book Esthetics and Politics, the Artist and the Statesman. He died on 7 February 1933, in Geneva, where he was waiting at the time to attend the re-opening of the League of Nations Disarmament Conference, by the American and British media, he was often called as The Grand Old Man of Central Europe. In Hungary he was named as The Greatest Living Hungarian,1889, Parlamentarismusunk veszedelme, őszinte szó Apponyi Albert Grófról. 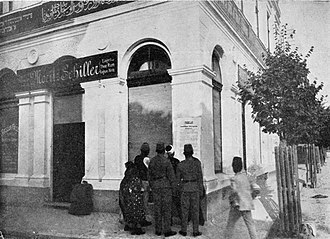 Budapest 1895, Aesthetika és politika, művész és államférfiu, Budapest 1896, Budapest 1908, A Brief Sketch of the Hungarian Constitution and of the Relations between Austria and Hungary. Budapest 1911, Lectures on the Peace Problem and on the Constitutional Growth of Hungary, Budapest, St.
Stillorgan, formerly a village in its own right, is now a suburban area of Dublin in Ireland. Stillorgan is located in Dún Laoghaire–Rathdown, and contains many housing estates and other facilities, Stillorgan neighbours other southside districts such as Kilmacud, Mount Merrion, Leopardstown, Blackrock and Foxrock. The suburban region defined as the Stillorgan electoral area of Dún Laoghaire–Rathdown and it is popularly believed that the name Stillorgan is either a Danish or Anglo Norman corruption of Teach Lorcan, the house or church of Lorcan, possibly signifying St. Laurence OToole. Another belief is that it is named after a Danish or Irish chief of a similar name, the original Celtic name for Stillorgan was Athnakill – Place of the Church. In the fourteenth century the manor of Stillorgan was held by the Cruise family, from whom it passed to the Derpatrick family and he was one of four sons of an OByrne princess and Murtagh OTuathail, King of the Uí Muirdeaigh III. The N11 road leads out from the city, passing through Stillorgan and it has bypassed Stillorgan centre since the mid-1970s when the Stillorgan Bypass was opened to the east. The N11 hosts the Stillorgan Bus Corridor which runs along the N11 in both directions from St. Stephens Green to Foxrock. Stillorgan is a bus interchange and the Stillorgan QBC is the most heavily used in Ireland, featuring the busiest and most frequent bus route. Aircoach provides a link to the Dublin Airport via Dublin city centre. Stillorgan has a station on the Luas green line, next to the reservoir and it has a commuter bus link to the shopping centre. The green line is 20 km in length with 22 stops and links Brides Glen, the Luas follows a line similar in some places to the old railway line in the area. Stillorgan railway station opened on 10 July 1854, closed for traffic in 1937. 60 houses were built at Beaufield Park in the 1930s The Merville Estate was built in the 1950s on land belonging to the Jolly family dairy farm, St Laurence’s Park were completed in October 1954. The Stillorgan Bowl opened in December 1963, the first bowling alley in Ireland, the first shopping centre to be built in Ireland opened in Stillorgan in 1966. The Royal Victorian Order is a dynastic order of knighthood established in 1896 by Queen Victoria. It recognises distinguished personal service to the monarch of the Commonwealth realms, members of the monarchs family, the present monarch, Queen Elizabeth II, is the Sovereign of the order, its motto is Victoria, and its official day is 20 June. The orders chapel is the Savoy Chapel in London, the organisation was founded a year preceding Victorias Diamond Jubilee, so as to give the Queen time to complete a list of first inductees. 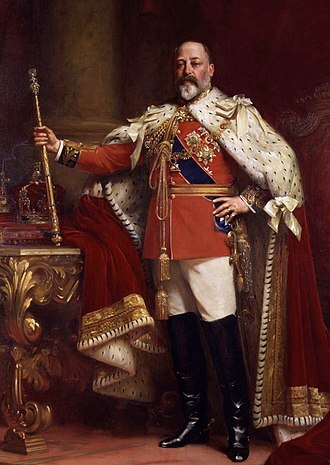 The orders official day was made 20 June of each year, in 1902, King Edward VII created the Royal Victorian Chain as a personal decoration for royal personages and a few eminent British subjects and it was the highest class of the Royal Victorian Order. It is today distinct from the order, though it is issued by the chancery of the Royal Victorian Order. The order was open to foreigners from its inception, the Prefect of Alpes-Maritimes, Queen Elizabeth II appointed her daughter, Princess Royal, to the position in 2007. Foreigners may be admitted as members, there are no limits to the number of any grade. Retiring Deans of the Royal Peculiars of St, prior to 1984, the grades of Lieutenant and Member were classified as Members and Members, but both with the post-nominals MVO. On 31 December of that year, Queen Elizabeth II declared that those in the grade of Member would henceforth be Lieutenants with the post-nominals LVO. Upon admission into the Royal Victorian Order, members are given various insignia of the organisation, each grade being represented by different emblems and robes. For Knights and Dames Grand Cross and Lieutenants, the orders ribbon is blue with red-white-red stripe edging, the only difference being that for foreigners appointed into the society, their ribbon bearing an additional central white stripe. For Knights Grand Cross, the ribbon is 82.5 millimetres wide, for Dames Grand Cross 57.1 millimetres, for Knights and Dames Commander 44.4 millimetres, and for all other members 31.7 millimetres. Sir Ernest Joseph Cassel GCB GCMG GCVO PC was a British merchant banker and capitalist. 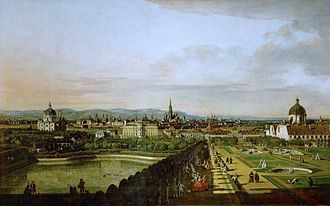 Born and raised in Prussia, he moved to Britain at the age of 17, Cassel was born in Cologne, in what is now Germany, the son of Amalia and Jacob Cassel. His father owned a bank, but the son Ernest arrived penniless in Liverpool. 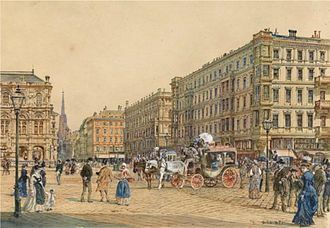 There he found employment with a firm of grain merchants, with an enormous capacity for hard work and a natural business sense, Cassel was soon in Paris working for a bank. 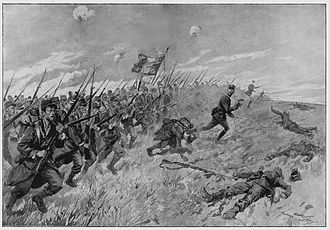 Being of Prussian origin, the Franco-Prussian War forced him to move to a position in a London bank and he prospered and was soon putting together his own financial deals. 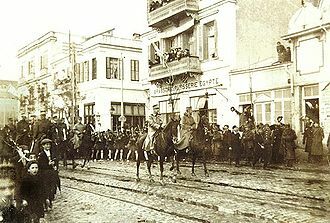 His areas of interest were in mining and heavy industry, turkey was an early area of business ventures, but he soon had large interests in Sweden, the United States, South America, South Africa, and Egypt. 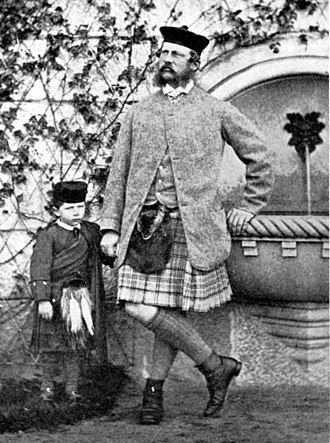 One of the wealthiest men of his day, Cassel was a friend of King Edward VII, prime minister H. H. Asquith. 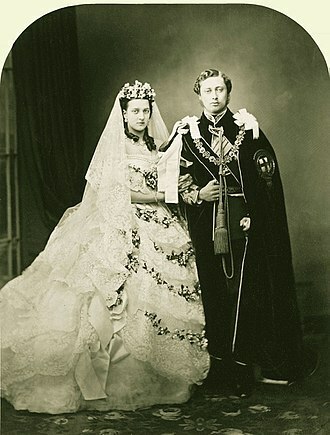 In 1878, he married Annette Mary Maud Maxwell at Westminster and their only child, Amalia Mary Maud Cassel, married Wilfrid Ashley, 1st Baron Mount Temple. Cassell became a Roman Catholic at the behest of his wife, the establishment was surprised to find out that he had converted when he chose to be sworn into the Privy Council with the Catholic Bible. Cassel retired from active operations in 1910. 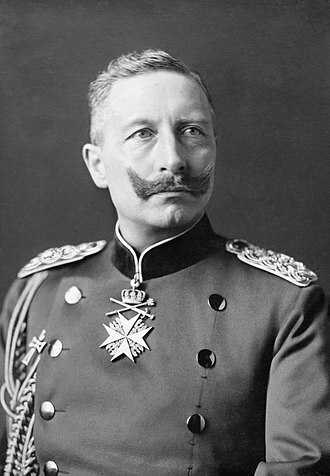 He built and endowed an Anglo-German Institute in 1911 in memory of King Edward VII and he owned a castle in Switzerland, which could only be safely accessed on a mule. When the inhabitants of the town said they were going to make a better road to his property, he answered, If you do. Felix Somary, who tells this anecdote in his autobiography, visited him there in 1914 to persuade him that war was inevitable, Cassel had a famous art collection and many beautiful houses. He bred racehorses and owned Moulton Paddocks in Newmarket, after the early death of his wife Annette in 1881, he and his widowed sister Wilhemina helped each other bring up his daughter and Wilheminas son and daughter. 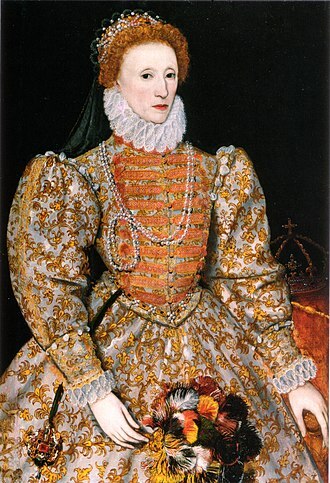 Maude died as a woman, leaving him two granddaughters Mary and Edwina on whom he doted. Cassels donation in Grängesberg, Sweden. Circe and the Sirens: Group Portrait of the Hon. Edith Chaplin, Marchioness of Londonderry, and Her Three Youngest Daughters, Charles Edmund Brock. Fisher House, home of the chaplaincy since 1924.